Well, it’s when you take objects that might be thought to be lacking on the design front – maybe even a bit tacky – but you reinvent them so that they are used as décor in an amusing way. Showing that you have a sense of humour.If you’re looking for something a little bit different and you and your bridegroom are a bit wacky, a bit alternative, fun-loving and definitely not traditional, then a kitsch wedding theme might be just up your street. You can really go to town at your reception. How about a line of garden gnomes along the pathway leading up to your venues? 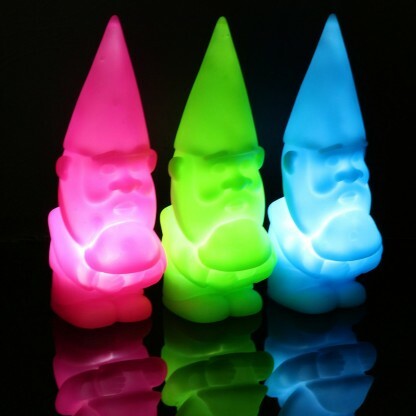 You can buy all sorts of garden gnomes online – including some in metallic neons, so your guests will be sure to get the kitsch irony of it all. You could use small gnomes as decorations on your tables. Gnome lighting anyone? Seriously kitsch. To serve your food, have a look at what’s on offer from party pieces website specialising in children’s parties. You could give each guests a goody bag with a superhero name containing sweets. Put party hats on the tables. Maybe party poppers. Attach balloons to the chairs with your names on. A kitsch theme can also extend to the type of food you serve – particularly the canapés. Talk to your caterer and see how they could help. Maybe retro offerings like pineapple and cheese sticks? Jelly and ice cream in children’s party sizes? (This is definitely the time to have a dessert table and/or a sweetie table. And you could have kitsch-themed cocktails, complete with umbrellas and straws in colourful glasses. If you’re having a buffet, dispense with china serving dishes and put finger food out in kitsch containers gleaned from the same party website – like this superhero theme bowl from Party Pieces. There’s also superhero themed table confetti on the same website. Talk to one of our venue stylists about how they could help you. Getting your chairs decorated the right way is a key part of the look. If you’re going for a superhero theme for example, you might want chair sashes in matching primary colours of bright blue, yellow and red. Don’t have just one colour either, mix it up a bit with different colours – alternating chair colours. You could add coloured napkins and co-ordinating coloured table-cloths. Call each table after the name of a superhero – Batman, Wonder Woman, The Incredibles … you get the idea. Decorations and theming shouldn’t just end at your tables. Think about the ceiling. Would you have coloured paper lanterns or drapes to create a particular mood and get the wow factor as your guests enter your reception? The benefit of getting one of our stylists involved is that you don’t have to source, buy or hire a lot of stuff yourself. Our well-equipped stylists will have a raft of props at their disposal which they can share with you – and they’ll also have some new ideas that you haven’t even considered. If your room is well located but rather ininspiring inside, you might want to consider room draping which basically creates a ‘set’ for you in a particular mood or ambience. The beauty of a kitsch wedding theme is that once you’ve decided on it, it can provide ideas for everything. Take the music – you might want to play a medley of tunes from a kitsch movie like “The Sound Of Music” or “Saturday Night Fever”. There are Ambience Venue Stylists all over the UK and there is likely to be somebody nearby who can help you. Check here to see who your local expert is – and consider having a kitsch wedding theme! Image credits: Garden gnomes via Glow. Superhero tubs via Party Pieces.